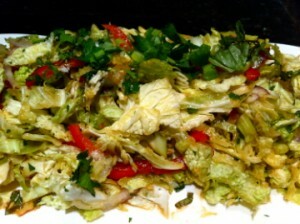 In a large bowl toss the cabbage, onion, bell pepper, cilantro and basil together. About 2 hours before serving, toss the cabbage mixture with the dressing. It will wilt slightly as the flavors permeate.